Catch the vision of Project Transformation and empower young people! LEARN: Research shows that cultivating youth voice and choice in educational and out-of-school settings is crucially important for youth engagement and, thereby, transformation. A George Lucas Foundation supported website, Edutopia, is a repository for instructional strategies and best practices for teachers, youth ministers, and out-of-school time professionals. Check it out! 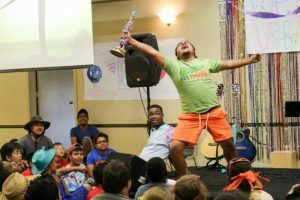 ACT: Read participant-to-young adult Sammy Ramirez’s story here! We are so proud that Sammy is one of over 50 child participants in the program to have returned to PT as college-age young adult interns since 1998! This phenomenon truly speaks to the depth and longevity of Project Transformation’s impact on young people’s lives and, therefore, communities. Now journal some responses to the following: Consider what you would might have said and done if you were Mary. Draw the emotion you may have had. Why was God able to use Mary? Even in the midst of a challenging personal situation, Mary clings to hope. God’s love and justice shaped Mary’s vision of the world. How do God’s love and justice shape your courage, hope and vision for the world?